Faith for life's biblical resources support faith engagement for people with dementia and carers through the use of interactive devotional activities, reminiscent images and objects that may relate to faith or spiritual life. For many, the cross is a sacred object that communicates beyond words and is a comfort to both the person with dementia and those providing care and support. 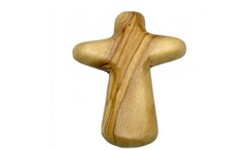 The Faith for life crosses are hand crafted in Bethlehem out of olive wood, usually sourced from the normal pruning of branches that is part of the growing cycle. They are light, smooth and fit easily into the palm of the hand to be held or gripped comfortably and with comfort. All of the Faith for live resources encourage communicating in more than words and the Textures of God's love cards in particular encourage finding objects and items that may provide cues and reminiscence of faith and religious practice. Faith endures through every season of life, including for people living with dementia. Faith for life acknowledges the profound dignity of the person with dementia, their desire to express and explore faith while also recognising changing needs. Using simple, uncluttered design and familiar and much-loved references, the Faith for life suite of resources enables engagement with the Bible and Christian practice, supporting ongoing spiritual growth.